Boots is a fantastic pup and is very happy with us! He seems very smart, full of energy and loving! 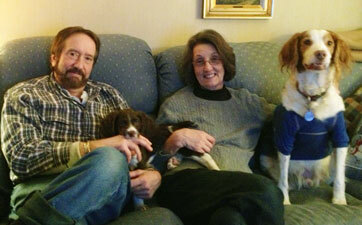 I’ve sent some photos along, the other Brit is my dog Stagger Lee with my mom & dad and Boots on the couch. The other is me & Boots! Hope all is well with your family and we will stay in touch! 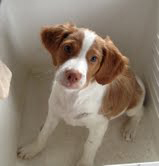 This is Riley (puppy #5 born 8/21/2013) at 5 months. He is doing just great. He loves the outdoors and gets along with his new friends at the doggie park. He is getting his new teeth and nips and chews a lot, but he is a puppy. Will send more pictures in the future. Just a quick update to let you know how Persephone is doing; she is perfect! We are just so impressed! She is playful and curious, but not aggressive. 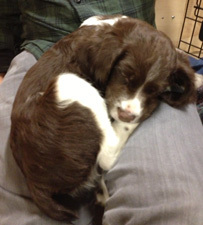 Her energy picked up after the first couple of days, but after plenty of play (and chewing) she is gentle and cuddly. 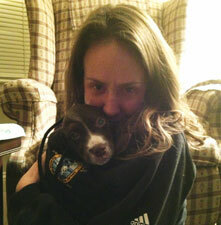 We’re not ready to let her out of our sight yet, but she is practically house -trained. We could count on one hand the number of “accidents” she has had in the house. In fact, she goes to the door already and lets us know when she needs to go out. She has taken very nicely to her crate and sleeps well at night. She got her second shot today. She weighed 10.8 pounds. Everyone at the vet’s office exclaimed what a calm disposition she has. We’re having a wonderful time with her! 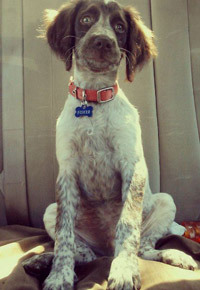 Included some updated photos of Sloopy (Charlie). He is such a great dog! We weaned him off puppy food a few weeks ago. Weighed him last weekend at 52 pounds. He is one of the most lovable dogs my family has ever seen! He has been training great!! We are very pleased. As you will see in some of the pictures we were home for the holidays so sloopy had plenty of play time with my parents three Brittany’s (6, 7, and 14 years old) and my brothers lab (4 months). I trained him on the electric fence at my parents house so he runs the acres as he pleases! We have had so much snow and he loves to romp around in it. I plan on starting to run with him when the weather warms back up. Thanks! Just wanted to share this photo of Bo. He is doing great, has started finding some birds on his own! He’s been such a great young dog it is tough to believe he is only 6 months. Thank you very much for such a great young pup! We got Maggie last August, Nitro and Jemma litter, and we couldn’t be happier. She may be the best birthday present that I ever received. She has quickly become part of the family. She seems to get along with everyone and gets very excited when we get visitors. We started hunting pheasant this fall and have done well. A little slow in the beginning but she has learned fast. She finds birds and holds a point long enough for me to get in position for the shot. After the bird is down she finds it for me, sits with it until I get there, but I can’t get her to retrieve it. She will fetch anything in the yard and will carry a dead bird around the house and show it to anyone that will look. Am I expecting too much from her this early or is there something I should be doing with her in the yard to get her ready for the field. 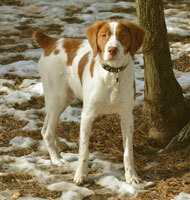 Don’t get me wrong just having her find a downed bird is a plus but I would like her to retrieve it for me. I have attached a picture of her with the first bird we got together. Just wanted to send you a little update in regards to Sophie from Jack and Scout’s litter. Sophie is 4 months old now and she is getting bigger every day. Now that she is fully vaccinated we have started to take her places. She goes with me in the afternoons to pick the kids up from school and everybody loves her. Lots of people ask me what kind of dog she is and remark on how beautiful she is. We took her to my son’s soccer tournament last week and everyone couldn’t believe how well behaved she was for such a young dog. She probably has one of the calmest personalities of any of the dogs I’ve ever owned. Every morning she sits patiently for me to get her food. She never gets over excited about feeding time and even when my other dog Cheyenne is eating she knows to sit and wait til Cheyenne’s done and then she goes over to lick her bowl after she leaves. She loves to swim as we took her to my sister-in-law’s pool and we have a baby pool at home just for her that she loves to just lay in the water to cool off. Family have commented to us that they never saw a dog just lay in water like she does. She’s a great dog and we are really enjoying her. She is going through a little bit of chewing stage. She loves socks and paper… they seem to be her favorite things to try and chew. She’s very good with “no” though and when you tell her “no” she pretty much stops what she is doing. She has already learned sit and down and she was good in the beginning with “come” but she has gotten a little stubborn at times with it and I have been working with her to get her better. Food is a good incentive and I have been trying to reward her whenever she does listen when I do ask her to come. She is pretty much house trained now too. Anyhow.. I just wanted to let you know that she was doing great and that we are enjoying her. 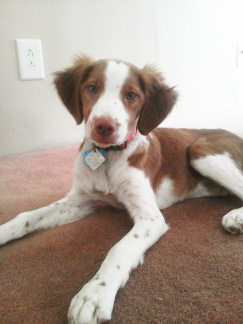 She has such a spunky personality that I just love and she has helped to fill the void that our other Brittany left and our family feels more whole now with her here. Thank you again and I will continue to update you as promised as she grows! I attached some pictures for you… I hope you enjoy them. FYI… I’m hoping all the pictures come through to you and the file is not too big because the picture of her on the picnic table is the “bad habit” my other dog taught her and is what she does when she wants to come in the house from outside. Enjoy!!! 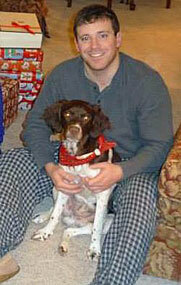 In July of 2010 we were blessed with a puppy from Jack Attack and Maggie. We wanted a female with liver coloring and when we saw Puppy #3 we knew she had arrived! 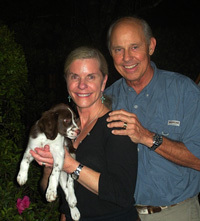 Well, Miss Dessa came to Texas and after four months of training with Mark in early 2011, our dog is the perfect all-around dog for Texas hunting. 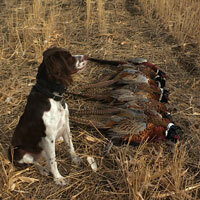 She retrieved around 350 dove in 2011 and 2012, including water retrieves. 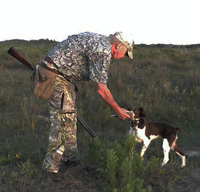 We had a good quail season on our lease and our little girl (26 pounds) pointed and retrieved over 250 quail. In addition, in October of 2012 she made a 1400 mile road trip to South Dakota where she had four days of pheasant, sharp-tailed grouse, and Hungarian partridge field work. What a great time it was! When I come home from work and walk in the door, there she is curled up at Drue’s feet while Drue works on the computer. Then Dessa and I are out the door for our work out, running in the neighborhood and polishing her hand signal direction skills. 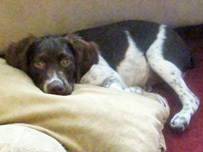 All in all, she is a great family dog with a loving and loyal attitude to these Texas parents. We have owned many Brittanys in past years. Dessa is the best of them all! We also know that Mark is the perfect trainer to whom we could have sent her. We are grateful she came into our lives and are indebted to Mark and Sue for such a remarkable all-around breed of Brittanys. 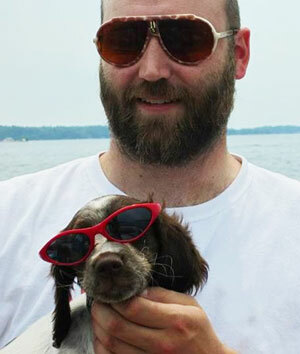 I thought we would check in a bit before you asked and let you know how great Fisher is and how happy we are to have gotten one of your pups. He has been well behaved in the crate from day one and has been a breeze to house break. Even though he is not very old yet we have been able to teach him to sit, stay, lay down, come, shake, and many other things. I swear you had already taught him to sit before he came with us because he sits and waits for me to give him food and water without a problem. He even waits for me to tell him to “get it” before eating. 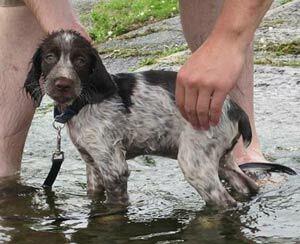 He has already been in the water a bunch of times and loves to go for hikes. I have been working on using an emergency whistle to call him back when he is off the leash and he responds to it perfectly. We love having him in the home with us and we do our best to keep up with him. He likes to bite at anything that comes near him so I stuff a sock in his mouth and that seems to work the best. Fisher has been a great addition to our family. I am putting some links below where you can view some pictures of Fisher on Instagram and also to the playlist I have for him on Youtube, including the one we took at 5 weeks. I have a lot more pictures on Facebook so I am attaching a few of those to this email. I hope you enjoy them. Just want to let you know how happy we are with our new puppy, Harley! 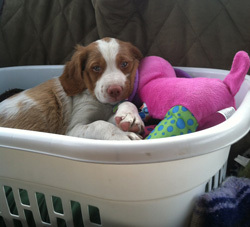 I was begging my dad to get a puppy and without me and my son knowing he contacted you and found Harley! 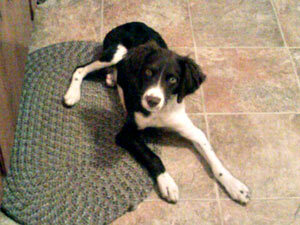 He is puppy #5 from Gabe and Jade’s litter born October 23, 2012. Harley has been such a great puppy and has made our home complete. He is a great, lovable, well behaved dog! We all fell in love with him instantly. My son is 8 years old and Harley is great with him! Everyone who meets Harley just can’t get enough of him. I really couldn’t have asked for a better dog. 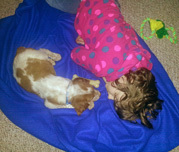 We will send more pictures in the future, thank you so much for our puppy! 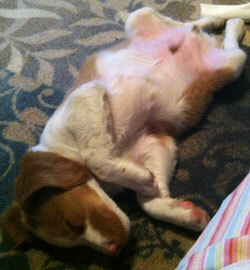 I wanted to give you an update on how Dixie from Gracie & Jack’s Litter is doing. She is growing up very quickly everyday it seems like she has grown more! She can now jump on the furniture and beds to take her naps. 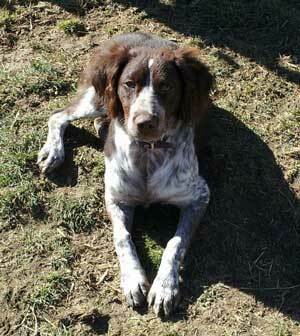 She is a fantastic girl and we are very happy to have her be part of our family; we also love the markings she has! Her coloring seems to get darker as she gets older. 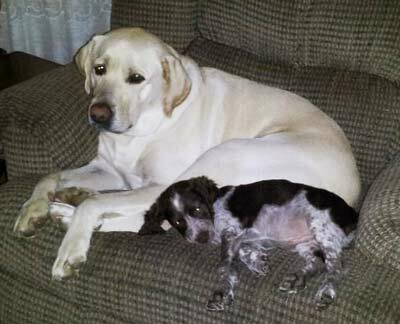 Her and her big “brother” Dusty have become the best of friends and love to play together and take naps together. 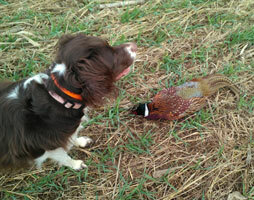 We have been working with her on training for hunting and she is doing excellent with it. 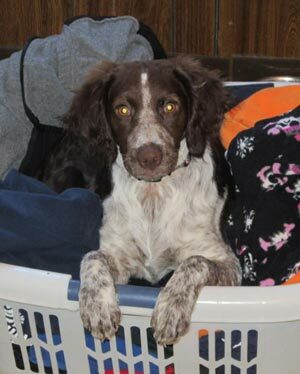 We will definiatly check out Rock Steady for any future dogs we are looking for. People ask where we got her and we are sure to tell them about Rock Steady! Thank you so much for a great dog! Just sending a quick email to let you know our little guy is doing very well. We went through a few names on the way home (Bruno, Stout), but we ended up deciding on Kinnis Stout Frederick. We will complete the AKC registration as soon as he gets micro chipped. Besides stopping for a few potty breaks on the way home from PA, he slept the entire ride. Kinnis is fearless, playful, and loves to cuddle. We are working on potty-training, but he’s been great in the crate overnight, and has actually been sleeping through the night. 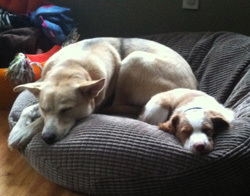 Kinnis and our other pup, Leah, play very well together, and I believe she’s finally comfortable with him being here. I’ve attached a few pics for you to check out. From the moment he walked in the door, he seemed adjusted. More pics to come! Saba will be 4 months in a couple of days and she is doing excellent! Her training is going great. She comes when I call, she is starting to quarter on her own, she is retrieving birds and putting them in my hand, and I can stop her and make her stay at any point in the field. Because she is so quiet Joan wanted her to ring a bell when she needs to go out, so in less than 4 days Saba was ringing a bell to go out. I researched kennels for over a year. Every inquiry I did lead me back to your kennel! 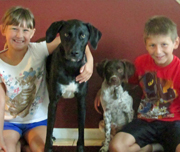 We could not be happier with Saba and your kennel. She is well worth the money and the 4 hour drive to get her! We can’t thank you enough! We all worked together to train them as they grew. We took two puppy-training classes together and both dogs quickly picked up all the basic commands, although they did struggle to learn not to pull when walking on leashes together. Each dog appeared to want to be in the front! 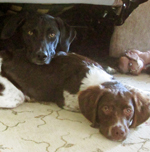 While we got these dogs to be family pets, we also wanted them both to be hunting dogs. 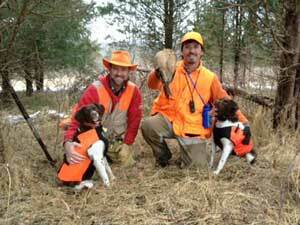 We do a lot of pheasant hunting here in New Jersey and we had high hopes that your breeding program would pay off and give us hunting dogs with all the natural abilities. Admittedly, we focused our training on the basics of obedience, but not all that much on fostering the actual hunting skills. We hoped that if taught to “Come” when called and to respond to commands like “Find-the-bird” as a positive, and “Too Far” as a negative, they would know what to do when we got them in the field. We carefully introduced them to gunfire using a starter pistol, eventually working our way up to shotguns. Brandy did show a little gun-shyness early (possibly brought on from a very close lightning strike and thunderclap she experienced), but we were able to overcome it with the careful use of the starter pistol while she was eating (an approach from an article Jen found on the web). We also worked both dogs on some quail we bought (at your suggestion) to establish the finding of birds and give them the true excitement of a live bird. 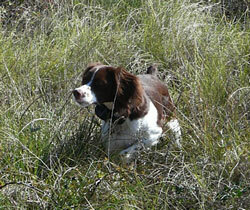 This worked well and Brandy has had no gun-shyness problems in the field. When it was time to bring them to the field this November (2012), we were careful to only bring them out in the afternoons of the days that pheasants were stocked. While this meant fewer birds to be found, it also allowed us to introduce them to the process slowly, and teach them to stay close to us first and foremost. They were both excited and willing from day one, working the fields and hedgerows just like they were born to it. It was wonderful to see their natural abilities on display as they sniffed the air to pick up scents and kept their noses to the ground when they found a scent to track. When the long awaited moment came and they put up their first pheasant, it was actually a surprise that happened behind us. We were able to bring it down and then quickly find it with Brandy and Kenai’s help. As they, and we, gained confidence we decided it was time to bring them out at dawn on a stocked morning late in the season. They flushed two birds for us that day and have flushed several more on the days since, responding to our commands the majority of the time and clearly enjoying themselves. They do have a lot to learn of course, but have shown all the potential of being wonderful hunting dogs for years to come. Another good point to make is how they hunt together. Other people had expressed concern about hunting litter mates together. The concern being that the dogs would be more interested in each other than hunting, but that has not been the case. They are all business when they are in the field, as if they know the difference between work time and play time. 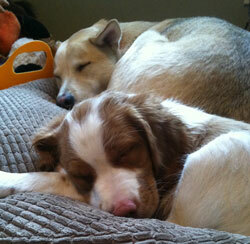 We want to sincerely thank Rock Steady Kennels for these two delightful dogs. 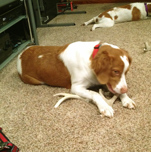 Brandy and Kenai are everything we had hoped they would be, as both pets and hunting dogs.